The end of the month of June and the month of July are often scorcher months temperature-wise around here, and the first week of July back in 2000 was no exception. We had placed an offer on the house, it had been accepted and now it was time for all the wonderful things that happen when you’re “in escrow”. Hubby had to work during the day, so I got to be the one that met with our agent while the inspections happened the morning of that first Wednesday of July 2000. How do I remember that it was the first Wednesday of that month? Well, I’ll tell you. Our agent, Joan, and I were standing in the stuffy house as the inspector was going through every nook and cranny to determine if this house was sound enough to be a wise purchase. 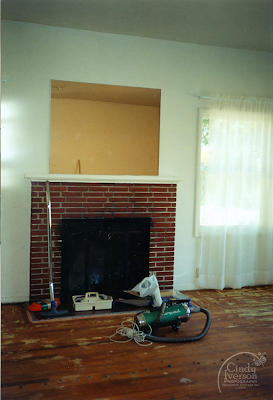 Hubby, Joan, and I had already been through a previous inspection on a previous property that we had wanted to buy. That previous inspection had uncovered issues that we were not willing to take on so we called the deal off. Having had a trial-run with our inspector, Jim, we knew he was good… really good. He left nothing uncovered. And he documented everything in a very well presented binder at the end of the whole shebang. So on this hot day in July, Jim was crawling around in the 3 foot crawl space under the house checking the foundation. He was up in a non-insulated walk-in attic that had to be over 100 F or more even at that time in the morning. He poked, he prodded, he kicked, and he scraped. While Jim was doing his inspecting, Joan and I stood around in the bare kitchen taking stock of the place. There was pale pink and green plaid wallpaper on the kitchen ceiling that had been there since the house was built. And it was encrusted with almost 60 years worth of cooking spatter and nicotine residue. This ceiling paper butted up against the laundry alcove off the eat-in kitchen area that had a bright red tomato patterned wallpaper (gotta love that combo). 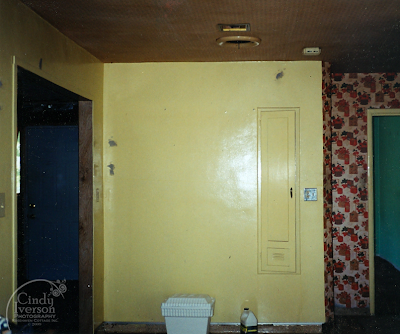 The rest of the walls were yellow while the kitchen cupboards had been faux wood-grained in a deep mahogany tone. Paired with the original black tile countertops and backsplashes, it was a real cave. As we looked around, Joan was trying to be optimistic and cheerful but I could tell that she thought Hubby and I were extremely naïve and looking at things with much too rosy an outlook. As we stood there chatting about all the DIY things I knew how to do because my parents built their own house when I was 6 years old, our conversation was suddenly interrupted by the wind up of a deafening air-raid siren. It sounded like I had walked into an old WW II movie. Joan’s eyes got huge and all her pretending that she wasn’t concerned for us went right out the window. The siren continued to blare for what seemed like an eternity (in reality it was probably about 60 seconds). We ascertained that the siren must be coming from the Shell oil refinery whose “lovely” stacks we can still see peeking over our tree-line in the back garden. When the siren finally wound down (sounding much like a deflating goose), Joan rehearsed with me again how we could back out of the offer for various reasons. She reminded me that if we found out someone had died in the house, we could walk away from the deal (just in case there were ghosts). If we drove through the neighborhood at anytime during escrow and saw drug deals or seedy characters, we could walk away. And she intimated that if this air siren from the refinery was indicative that our health would be at risk, we could also walk away. But surprisingly, I felt very calm inside. I had this peaceful sense that it was no big deal. I just smiled and genuinely giggled at the comedy of the whole situation. Joan laughed along with me, albeit nervously. Jim completed his inspection not long after the siren had gone off. I asked him what his preliminary verdict was. He said that he found the foundation to be sound. The house was even strapped to the foundation so it would be solid in an earthquake. He said the house “had good bones”. It just needed lots of TLC. Joan asked him for a ballpark estimate on how much “TLC” we were looking at (again she was trying to be realistic with this obviously delusional woman standing next to her). Jim casually rattled the figure of $50,000 minimum to get the house truly livable. And despite that figure, again, I was calm and cool (not like me at all). In the week following the inspections, our little house was tented in a large covering looking much like a dirty red and yellow circus tent so it could be fumigated. We drove by it once while it was all wrapped like a giant birthday present. It looked so odd like that. We were glad when the tenting came down. The weeks of escrow passed quickly and soon we were signing the final documents that made the house ours. 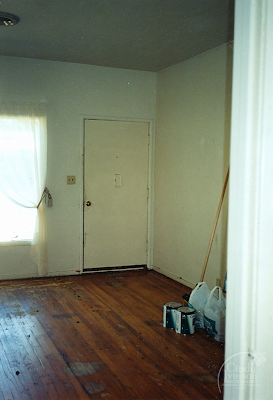 By July 28, 2000, we were handed the keys and the house was all ours. The following week, on the first Wednesday of August, the air-raid sirens went off again… at 11 o’clock in the morning just like they had when Joan and I were there. It turns out that is the oil refinery’s scheduled monthly drill to make sure the sirens are operable and in working order. And every Wednesday since then at 11:01 a.m we are serenaded with the sound of a deflating goose. Cindy you are brilliant at telling a story! You make it come alive - well done. I am looking forward to Chapter 3. What an interesting story. I had to laugh about the siren. After we bought our house, we discovered we can hear the Sheriff's dept. 's firing range. For the longest I thought they were roofing houses nearby and that I was hearing a nail gun!!!! What an interesting and lovely story. I have always been a sucker for old and delapidated, must bring out the nurture side of me. Sorry I did not mean yours was either but you get the gist. .... that kitchen WAS a cave!!! I can't imagine being calm when confronted by tomato wallpaper! But I guess it turned out alright! Girl, what can I say. You had a vision, for sure. I look at those photos and I think, you had to really be sure, and look at what you have accomplished now. Some things are just meant to be, and this house was meant to be yours. This is so much fun to view how your home started out! My mother cried when she saw our first house. She thought we saw it through rose colored glasses and weren't paying attention to the mess. But, it was a cute little cottage when we were finished with it. I love the imagery of a deflating goose! It is hard to believe that Rosehaven Cottage ever looked like this. It is so beautiful and warm now. I'm anxiously awaiting the next installment. Loving this story--keep it coming! I am so enjoying the story of your home. Don't stop! Keep sharing, please!! Amazing transformation! You worked magic ... it is so blissfully beautiful now! Thank you, thank you for your suggestion of planting lavender for Royal. Great info! I'm off to the nursery! The once a month siren I could probably giggle over....but that kitchen. Oh man...that is GLOOMY. I'm not sure I could have seen past that. It sounds like you had some amazing people around you in Jim & Joan. 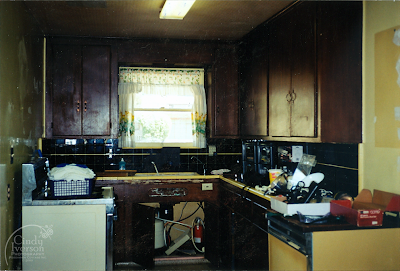 The pic of that kitchen brought back memories of how the kitchen looked in this house I am now living in: grotty and the rest of the house didn't look much better! But, like yours, it has been turned into a dream home.